Lightroom Classic Tutorials > Organizing Photos > Keywords > Should I use flat or hierarchical keywords? In the last post, we were talking about the kind of keywords to add to your photos, but this week, let’s talk about the pros and cons of flat vs. hierarchical keyword lists. On the left, we have a single long flat list of keywords, and on the right, a hierarchy of keywords nested inside other keywords. So which should you choose? Simplicity – Adding new keywords to a hierarchy requires a little more forethought and logic, whereas adding random keywords to a flat list can be done on-the-fly. Universally Understood – Flat keywords are understood by most photographic software. 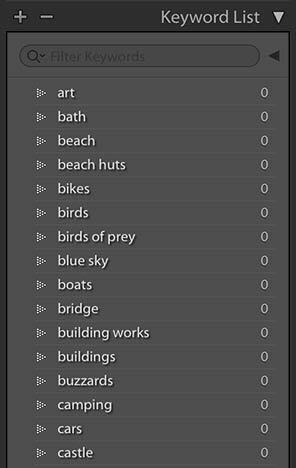 If you create a hierarchy in Lightroom, it writes out the keywords as both flat and hierarchical, so if you move to other software, your keywords will still go along for the ride, but probably as a flat list. Editing in Other Programs – In addition to moving to other software in the future, you can also run into issues with keyword hierarchies when exporting photos to edit in other software and then adding them back into the catalog. If some keywords are set to “Don’t Export” (often used for parent keywords like who, what, when), when the photos come back into Lightroom’s catalog, their keywords will be listed as new root level keywords. Scrolling – If you start adding a lot of keywords to your photos, a flat keyword list can become very long very quickly. If you’re on Windows, you may even run into a bug/limitation, which prevents the Keyword List showing more than around 1600 keywords at one time. A keyword hierarchy allows you to collapse the list, so you’re seeing fewer keywords at any time. Automatic Entry – One of the major advantages to a hierarchy of keywords is that parent keywords are automatically added to the photos. For example, if I tagged a photo with “my house”, the parent keywords “Southampton, Hampshire, England, UK, Europe” would automatically be added to the photo too. This can save a lot of time. Time Spent Reorganizing – If you don’t start out with a clear idea of how you’ll organise your keyword hierarchy, you can spend a lot of time organizing and reorganizing the keywords into a list you like. Multiple Catalogs – If you use more than one catalog (and we considered the pros and cons in this earlier post), and you reorganize a hierarchical keyword list in one catalog, you’ll end up with a massive mess and duplicate keywords when you try to merge that back into another catalog. This can even apply to travel catalogs. Your final decision will probably depend on how many keywords you think you’re going to add. If you’re shooting for stock photography, a hierarchy is the obvious choice. If you’re shooting for your own use, a flat list may be a simpler choice. There is, of course, a compromise. You could have a very simple hierarchy, with a few parent keywords and all of the other keywords nested directly inside, for example, your parent keywords might be who, what, where, when, why, how. These can also act as a prompt, to remind you to add at least one keyword for each. You can even create a smart collection to show photos that don’t have at least one keyword under each heading. If you decide on a hierarchical keyword list, draft your list in a text editor or spreadsheet, or even on a piece of paper. By doing so, you’ll save yourself a lot of time rearranging your keyword list later. One more tip… when adding People keywords, don’t try to create a family tree. Since most of us have more than one parent, it gets messy fast! In the next post, we’ll start on the practicalities – how to create keywords, apply them to your photos and most importantly, how to use them to find the photos again later. You can buy in properly structured* hierarchical keyword lists. I bought one of 11,000 keywords. It is now about 12,000 keywords as I have added in my own local and specialised words. *properly structured? I got one that conformed to the IPTC (http://https://iptc.org ) structure used by the Press/News media internationally because I do photo journalistic work. I am sure there are others of other specialisations. One thing it does do is quickly and easily add a full set of keywords to an image. (couple that with profile pre-sets and you quickly and easily get a comprehensive set of metta data for any image. but in an organised way. A few years ago I bought the ‘England’ keyword set from http://www.photo-keywords.com/ (run by a chap called Tim Makins) and it still forms the basis of my keyword hierarchy. I bought the controlled vocabulary list because it has an IPTC (Press/Media) structure BUT having looked at the photo-keywords notes from the above posts I can add some more notes. There are other fee lists available and I have three other small specialist lists I have integrated over time into my main list. This leads you to an interesting dilemma. Do you have a bought list you get updaters for and a separate custom list or do you buy one commercial list and edit that but not update it. I have taken the latter route. So I have a base list that is well structured and covers “most” things and have added extensively in specialised areas inside the structure of the main list. The advantage is that my new words are in a recognisable structure and there is a lot of information on the IPTC structure. However if you don’t need the specific structure then it is less relevant and anyones system is as good as any other I would think. Thanks for sharing your experiences guys. That’s very helpful. I built my own hierarchical keyword structure based on my own content. I also rely on synonyms a lot as well. So when I keyword a photo of a Galah it will be in a taxonomic hierarchy (Animal/bird/parrot/galah – actually a bit more complicated than that). The keyword “Galah” will have a synonym “Eolophus roseicapilla”. I often use synonyms when there is an implied correspondence. E.g. “constellation” (which will be in an astronomical hierarchy) will have the synonym “sky” because that is where they tend to be! I know it’s not a true synonym but it works for my photos. The other thing one can do is export the keyword list as a text file and then import it when starting a new catalog. When I travel I create a new catalog for that trip. I import my main keyword list and start there. When I get home I import the catalog I created into my main catalog. The advantage is I do not have to recreate the hierarchy and worry as much about poor and different spelling. Yes, that helps. Just remember not to reorganize your keywords while you’re away! Could you detail how to export the keyword list as a text file? It’s Metadata menu > Export Keywords Winston. Another excellent piece about tagging images with keywords, Victoria. You mentioned the following: ” If you create a hierarchy in Lightroom, it writes out the keywords as both flat and hierarchical, so if you move to other software, your keywords will still go along for the ride, but probably as a flat list.” It seems to me that if a hierarchical structure is important to you, you will always be able to find an excellent cataloging program that also uses it. I don’t use Lightroom for cataloging purposes, yet the program I do use recognizes both the flat and the hierarchical structures. You also mentioned that “If you don’t start out with a clear idea of how you’ll organise your keyword hierarchy, you can spend a lot of time organizing and reorganizing the keywords into a list you like.” That gets us back to the discussion in your previous piece about the benefits of beginning with a controlled vocabulary; the hierarchy is already organized with no need to spend time reorganizing anything. You mentioned the helpfulness that a hierarchical structure automatically adds all of the parent keywords when you tag an image with the lowest keyword in the hierarchy. It’s worth noting that doing so makes it a LOT easier to find an image when you don’t remember that lowest term in the hierarchy. As an example, you might remember that a particular image was taken in a suburb of a major city but you may only remember the name of the city, not the suburb. You can then conduct a search of the city’s name. Having done that the names of its suburbs will also be displayed lower in the hierarchy. Most likely you’ll remember the name of the suburb once you see it even when you weren’t able to recall it on your own with no reminder. If nothing else, you can review all the images in that city to find the image made in the suburb, whereas using a flat structure might require you to view all the images in that country. I’ll offer just one more thought that comes with the warning that it might be controversial: My thinking is that the people who can understandably get by with a flat keyword structure can probably get by without tagging their images; instead, it’s likely that using only a well-organized, thoroughly thought out physical folder structure will meet their needs. Another way of putting it is that if someone is having a difficult time finding their images using only their physical folder structure, they probably ought to use a hierarchical keyword structure because a flat structure will likely be at best only a small improvement over an effectively conceived physical folder structure. Thanks for sharing your thoughts Mike. Excellent point on the hierarchy being useful as a memory prompt too. We’ll have to disagree on that one. Take, for example, the names of family members. Keywords allows you to add multiple names to the same photo, whereas a folder structure with family names would require duplicating the photos. A bit more on why I don’t think topic-based folders are a good idea here: https://www.lightroomqueen.com/why-not-organize-photos-into-folders-by-topic/ But I do that those who only need a simple flat list probably won’t need to enter many keywords. You’re correct about that, of course. Photographers who would find it helpful to have images of people tagged with more than one name could make good use of keywords, whether in a flat or hierarchical structure. However, not all photographers have that need. As an example, though I use a controlled vocabulary that began with over 11,000 keywords and a hierarchical structure, I’ve never had the need to tag an image of a person with more than one name. Of all the members of my family that I’ve photographed, only two of them have changed their name due to getting married and I have no problem remembering their name. Indeed, I could easily find the photos of them using the structure of physical folders. More to the point, that’s how my wife would find them because she doesn’t want to have to learn to use the catalog. Keep in mind that I wrote that people who can understandably get by with a flat keyword structure can probably get by without tagging their images; instead, it’s likely that using only a well-organized, thoroughly thought out physical folder structure will meet their needs.” The words, “probably” and “likely” are the operative words; I certainly wasn’t implying that there is only one good way to get things done. Ah ok, I think we’re talking at cross-purposes. I meant, what if there are multiple people in the same photo. If a photo includes Susan and Kate, it’s better to tag it with Susan’s keyword and Kate’s keyword, rather than having to duplicate it in a Susan folder and a Kate folder. But perhaps you have an alternative folder structure in mind for that scenario. My take is that an alternative for keywords is using collections. I do so whenever it is a) for my internal purposes only, w/o a need to travel with an exported image and b) if it would not be a repeated keyword, e.g. for a journey destination I will not regularly return to. This helps me keep my keyword list fairly lean, by having a nested collection structure along with it. Which is easily accessible in every module, w/o the need o fother prior filtering. Folder structure is a different problem. 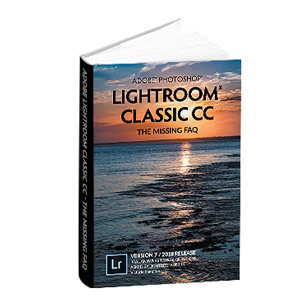 (Scott Kelby, love him or hate him, has chapter 1 of his LR book on this, outlining several strategies. you should read *before* you install LR) However it is largely rendered irrelevant by the use of keywords.You need a folder structure simply to keep things organised and tidy. 50,000+ images in a single folder isn’t going to work. With good key wording I just create a smart collection and use the appropriate keywords (and other meta data) and very quickly have the[set of] image[s] I need. I don’t see the underlying folder structure. I think we are all agreed that a hierarchical keyword structure is the only way to go… especially with over 12,000 keywords 🙂 As with the folder structure the only real discussion is the structure of the hierarchy. I like to use the hierarchical keyword structure but I haven’t figured out how to do that with the some of the LR tools for keywording. I would appreciate any tips you can provide for using the people recognition and spray painter tool with hierarchical keywords. For face recognition, right-click on the parent keyword you’ve created and choose “Put new person keywords inside this keyword”. Any new people you create using face recognition will automatically be nested inside your chosen keyword that way. For the Painter tool, what are you getting stuck with specifically? Keywording can a pretty straight forward job for certain styles of photography. For instance if you shoot 500 images of the same or very similar subjects. Keywording can become a real PITA for photographers who shoot very varied subjects on the same card. I’ve spent as much as 1 hour keywording a single card’s worth of 500+ images! One trick I’ve learned to use when time is tight is to just keyword images with a single parent keyword. Thus in the hierarchy animal/bird/hawk/ broad wing I initially just apply hawk. This automatically applies animal and bird. I then apply the keyword not fully keyworded to these images. 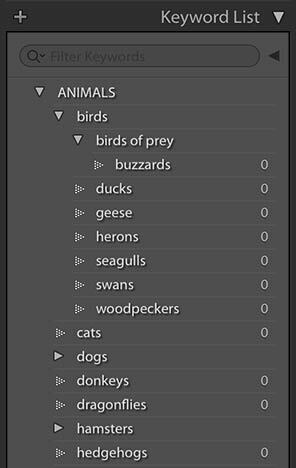 At a later date when time becomes available I conduct a metadata search on bird/not fully keyworded and finish adding more detailed keywords like red tailed, peregrine, etc. Good tip, thanks for sharing Winston. Winston, that reminds me I have a set of meta keywords. I have a top level word (jagraphics) under which I have a whole load of metadata keywords. I have a tag for images loaded to a particular on-line gallery, (of which there are several) also for those sent to a particular agency, or those that *have been* used on the gallery in the past. IE MAE12, LSF12, BLDM usually the used images are marked MAE12-X, LSF12-X this means any used are not inadvertantly re used. however it means it is also easy to find current and past sets of images used on any gallery or other on-line set. Synonyms don’t work quite like that. They get added “behind the scenes” so you can search on them, but they don’t show up in the Keyword List panel. You could try defining a keyword preset, and then applying the present on images containing a daffodil. I use presets to add multiple tags in multiple categories (e.g. Geo tags and WHERE keywords simultaneously by choosing the preset and applying it to the images I’ve selected). I have a flat keyword list. I don’t see a need for hierarchy as I never look at the keyword list. 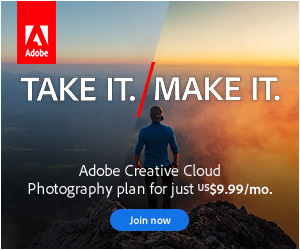 I type in a word and Lightroom usually finishes the word for me. If the word does not exist in my keyword list, it will when I finish typing the word and hit RETURN or COMMA. I don’t know how many keywords I have but I do know I have 1.4 million images in Lightroom and without keywords I would have trouble finding the images I want. Using the folder structure alone would be a nightmare. The U S Library of Congress publishes a controlled vocabulary called “Thesaurus for Graphic Materials”. It contains over 7000 terms useful to photographers and is a free download. I’ve received this “dotted hierarchical” version by contacting the TGM editors at Library of Congress.